This idiosyncratic guide describes not just the famous places but many out-of-the-way ones. We began preparing it some 20 or 30 years ago for the use of people staying at our family house Casabianca di Barontoli near San Rocco a Pilli some 10 km south of Siena. 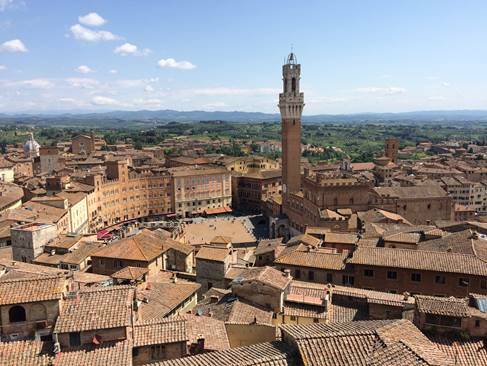 It therefore concentrates heavily on places in the city of Siena or to the south of the city, including many small sites of mainly local interest not mentioned in most English language guides. It is not intended to be a comprehensive guide. On the basis that, if time is limited, it is better to look at a few things in a town, museum or church properly than to look at everything superficially, it describes only the buildings and objects that the author thinks of most interest. In particular, it tries to give a fair amount of detail on works of art – such as cycles of frescoes – the enjoyment of which may be enhanced by knowledge of the story portrayed or the symbolism. Charterhouse of Pontignano (former Carthusian monastery in the Chianti). San Leonardo al Lago and the Pyramid (former hermitage in the hills with good frescoes).